Montalcino looks much the same as it did during the middle ages. The beautiful Renaissance era churches, piazzas, and houses take you back in time as you walk through its cobblestone streets. Stone walls built to protect the town from invaders still define the perimeter as it stretches out along the top of an elongated hill overlooking the Tuscan countryside. Montalcino has an impressive history. It’s thought that ancient Etruscans inhabited the area sometime between 700 and 300 BC. Although the original Etruscan structures no longer exist, many buildings built in the 1300’s are still standing. Apart from its historic architecture, Montalcino is famous for it’s wine. Brunello di Montalcino, a delicious dry red wine made from Sangiovese grapes is produced at about 200 wineries around Montalcino. 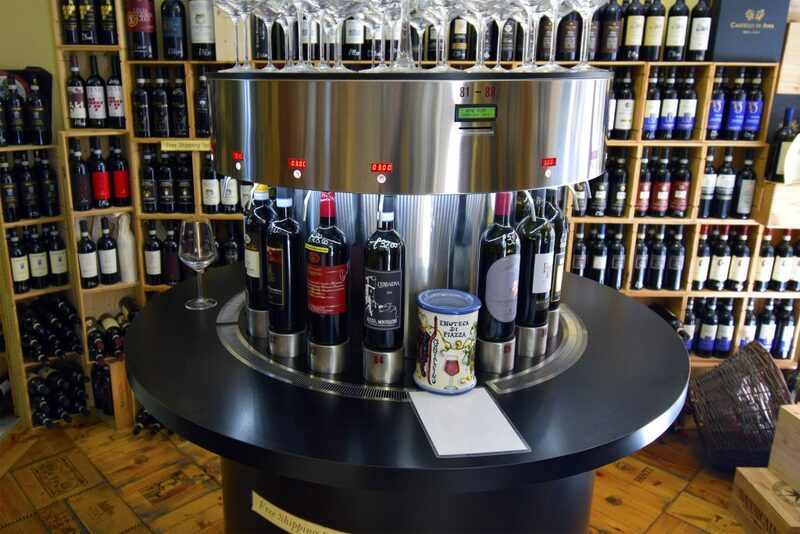 Wine shops (enotecas) are everywhere, and most offer tastings and a large selection of Brunello for purchase. Getting to Montalcino is easiest by car. It’s about a 2 hour drive from Florence, or an hour drive from Siena. Only residents are allowed to drive inside the town walls, so once you get there, you’ll need to park outside the town walls and walk in. There are several parking lots near the traffic circle outside of the main gate into town. But when we arrived all of the parking lots were full, so we drove up Via Osticcio and found a free spot on the side of the road. 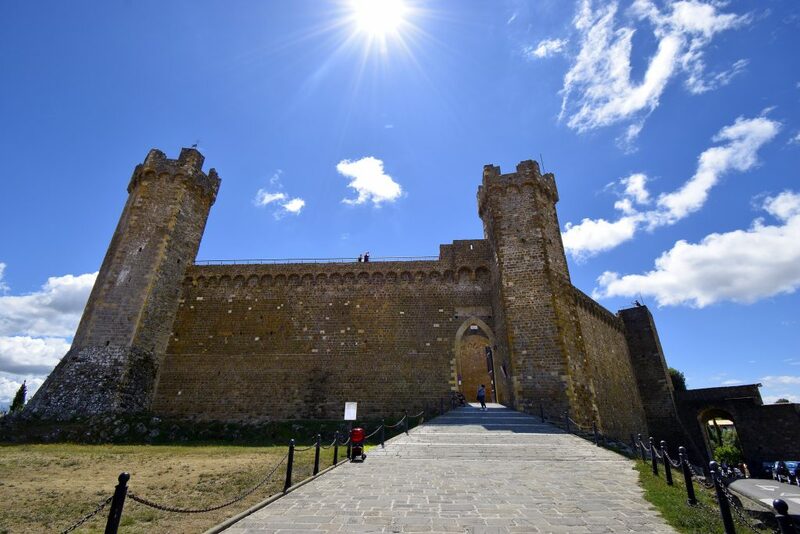 When you enter Montalcino through the main gate at the south side of town, the first thing you’ll see is the large pentagon shaped Fortress of Montalcino. Montalcino was caught in the middle of the wars between Siena and Florence in the 14th century. After the Battle of Monteperti, it became one of Siena’s main outposts. In 1361, the fortress was built to protect the town. Even after Siena was eventually conquered by Florence, Montalcino resisted for four years and the fortress was never taken. Today, you can enter the fortress and explore it. You enter the fortress through large wooden doors into a courtyard with a wine bar, tables and chairs, and a public restroom. 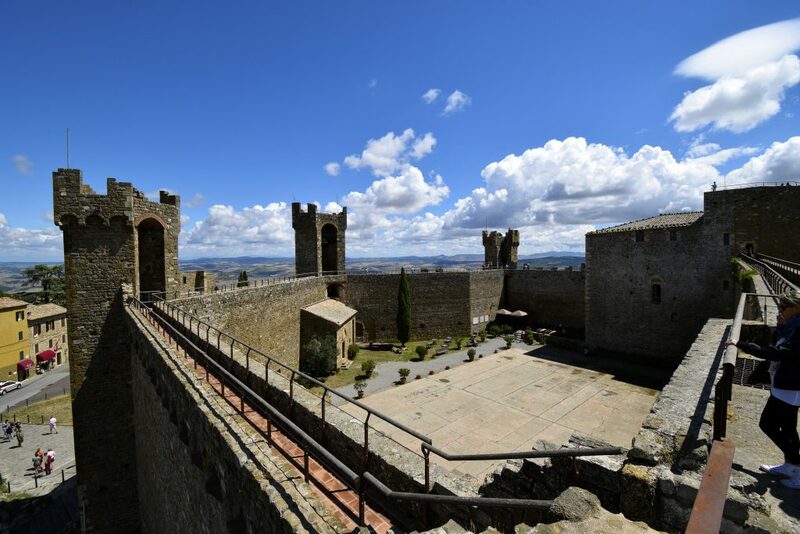 The fortress sits at the highest point in town, and you can climb up to the ramparts for a stunning view of Montalcino and the surrounding area. It’s a short climb up to the top. Once you’re there, a walkway goes all the way around the fortress so you can see in every direction. It’s probably the best view in Montalcino. The staircase that leads up to the ramparts is inside the wine shop. You’ll have to buy a ticket, which costs 4 Euros for adults. 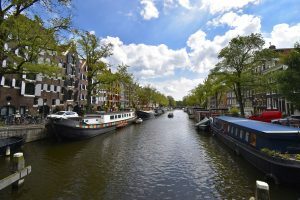 The stairs are only accessible when the wine shop is open, which is from 9:00 am to 8:00 pm in the summer and 10:00 am to 6:00 pm in the winter. 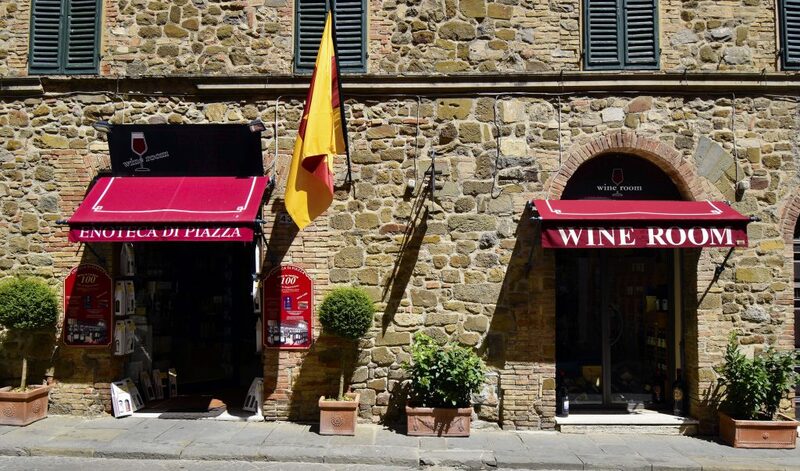 After you check out the view from the top of the fortress, stop by Enoteca La Fortezza inside the courtyard and try some of the town’s famous Brunello di Montalcino. 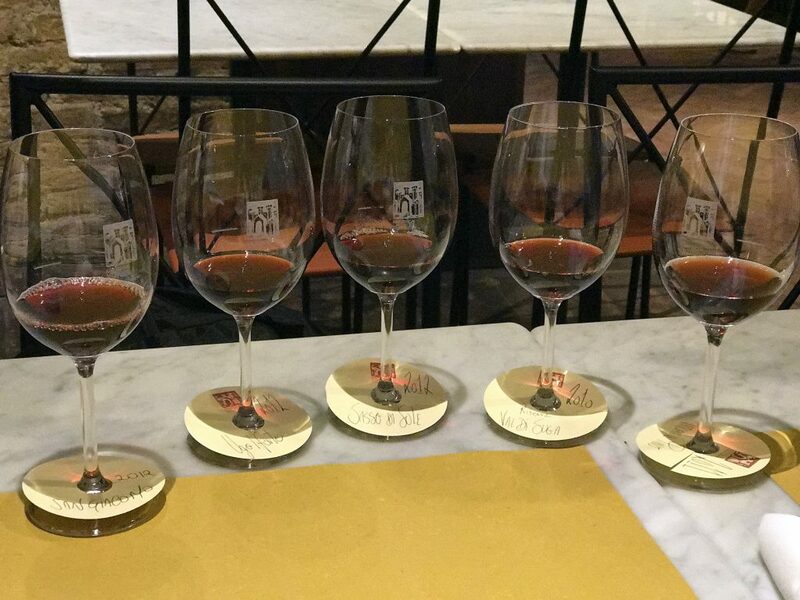 They offer a range of tasting options with different Brunello vintages. We chose the 5 glass tasting and liked them so much we shipped home 6 bottles of our favorite ones. They also have a great food menu with traditional Tuscan dishes. Mae had the Pinci a Ragu Classico, and I had the Maltagliati Duck Ragu. Both dishes were recommended to us by the server because they pair well with Brunello. They were excellent! And fairly priced too. A short walk from the fortress down Via Ricasoli is Palazzo Pieri, a cool old building with a shaded courtyard. Built to house French soldiers during the French occupation of Montalcino from 1555 to 1559, it was purchased in 1920 by residents of Montalcino. Now it’s the home of the ARCI di Montalcino, an organization that holds concerts, dances, and art exhibitions throughout the year. There’s a bar there too, the Bar Circolo Arci. It’s a great place to relax in the shade, have a drink, and check out the old well in the center of the courtyard. Just across the street from Palazzo Pieri is the Chiesa di Sant’Agostino. Originally built in 1227 by the Augustinian order, the church was rebuilt in Gothic style in 1380. The walls inside the church are painted with 14th century Catholic frescoes, including a “Doctors of the Church” and a “Passion of Christ” by artists from the Siena region. 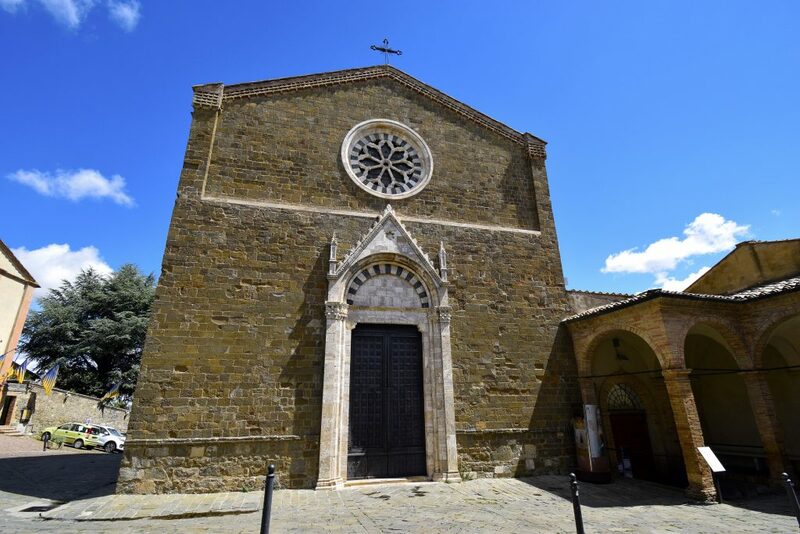 The Chiesa di Sant’Agostino is also the home of the Museum of Montalcino. It has one of the largest collections of paintings and sculptures from 14th century Tuscan artists. There are also artifacts recovered from archaeological excavations around Montalcino with pottery, tools, and ornaments dating as far back as the Bronze and Iron ages. From the Chiesa di Sant’Agostino, take Via Spagni up the hill and you’ll reach the Cathedral of San Salvatore, Montalcino’s main duomo. Since the year 1000 there has been a church at this site. The original Cathedral of San Salvatore was built in the 14th century, but was demolished and rebuilt into the present cathedral in 1832. 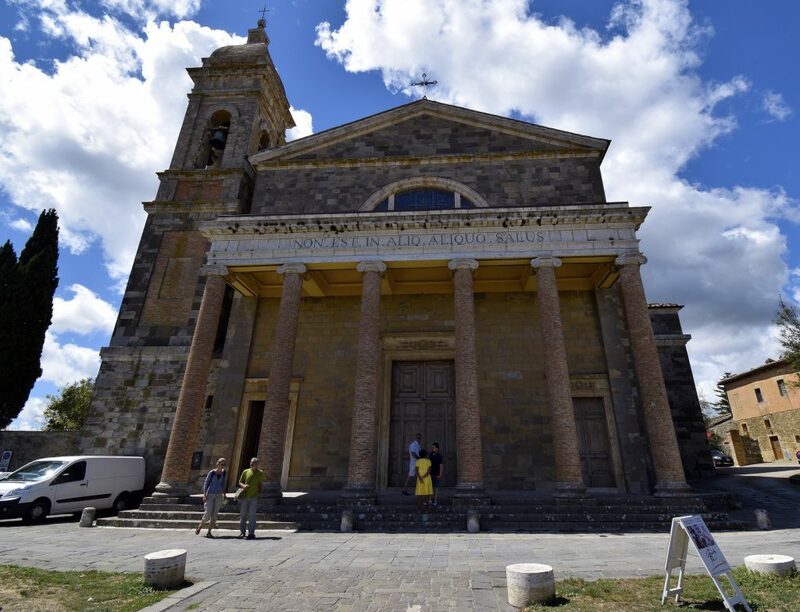 Standing in front of the cathedral you can look behind and see a nice view of Montalcino, or you can go inside to see the altar and several paintings by Fransesco Vanni and Francesco Nasini. From the duomo, Via Spagni continues downhill through an old residential neighborhood and ends at another cathedral called the Madonna del Soccorso. The church is perched high on the edge of the hill just outside of the town walls. 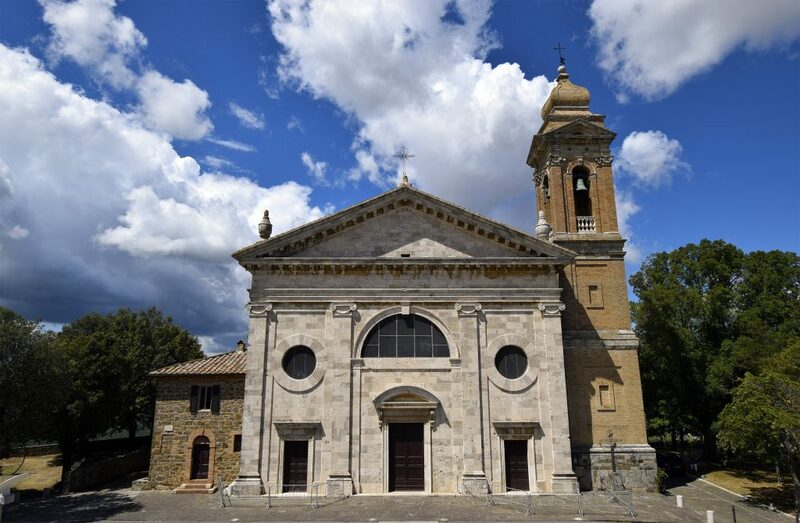 The present cathedral of Madonna del Soccorso was built over centuries, but began as fresco of “Madonna and Child” on the exterior of the town walls to protect Montalcino during the wars between Siena and Florence. The painting attracted a large following, which later prompted town officials to build a church at the site. Inside the church are beautiful frescos that have recently been restored. There’s a painting of the Crucifixion by Fransesco Vanni, and a “Virgin surrounded by Angelic musicians with Saints Sebastian and Roch” painted by Vicenzo da San Gimignano. 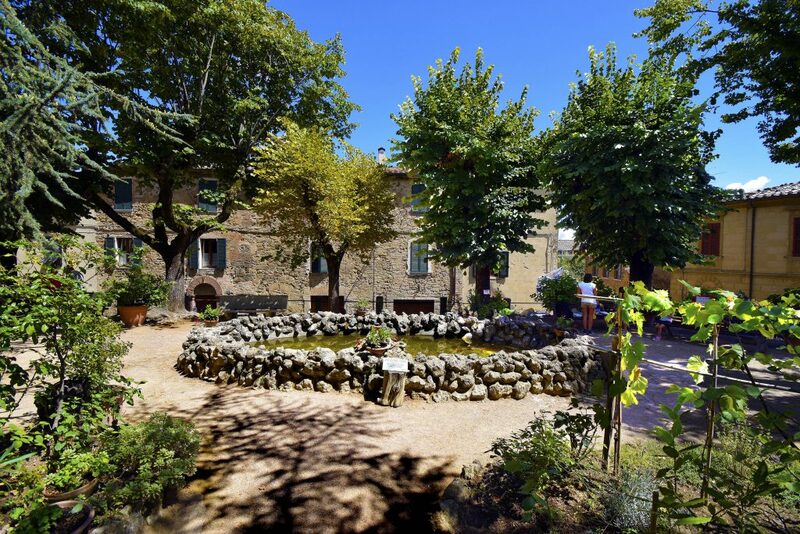 There are small parks on both sides of the cathedral that have beautiful panoramic views of the vineyards and olive orchards below Montalcino. At this point, you’re at the far north end of town. If you take Via Roma back towards the center, you’ll soon reach Piazza Cavour, a little square with a fountain, shade trees, and benches. It’s a good spot to take a break and sit in the shade. There are also a couple cafes and restaurants around the square where you can sit and eat. 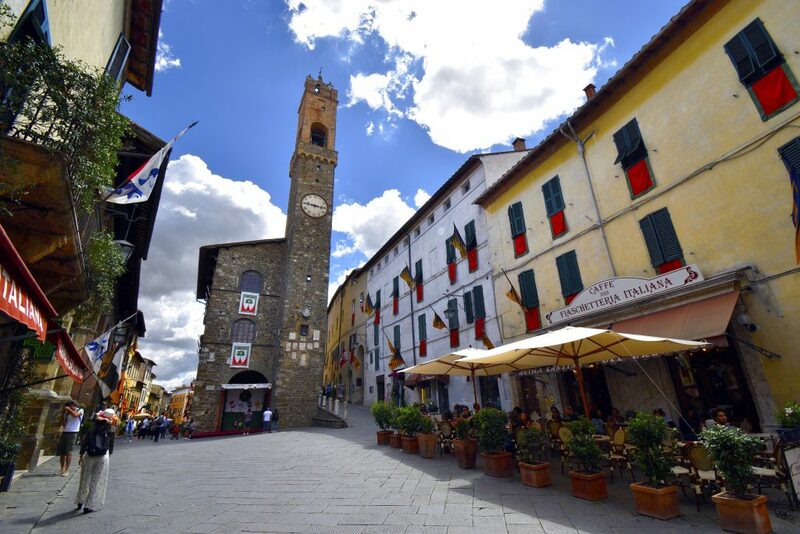 From Piazza Cavour, head back up the hill on Via Mazzini and you’ll reach the main square of Montalcino, Piazza del Popolo. The Palazzo dei Priori, a large bell tower and clock sits at the center of the plaza. 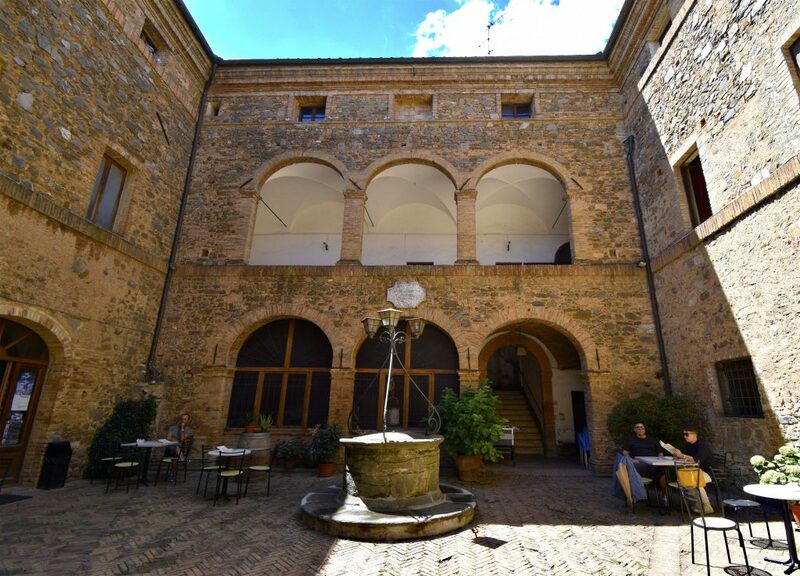 Palazzo dei Priori was built in the late 13th century and is now the town hall. The front of the tower displays the marble coats of arms of the podestas (similar to mayors) that have governed Montalcino over the years. Around the side of the Palazzo dei Priori is La Loggia, a building with tall round arches over an open space that has a statue of the Duke of Florence Cosimo I de ‘Medici, by Giovanni Berti. The Fortress of Montalcino enoteca isn’t the only wine bar in town. Far from it actually. The town is full of wine bars and wine shops. Brunello di Montalcino is their main offering, but other Italian wines like Chianti, Barolo, and Vino Nobile di Montalcino are sold as well. Almost all of them offer tastings. As we explored the town we stopped by a few. Enoteca di Piazza and Enoteca Pierangioli were our favorites. 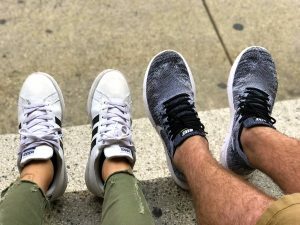 Both of them are near Piazza del Popolo. Subscribe to get our awesome travel stories sent straight to your inbox. 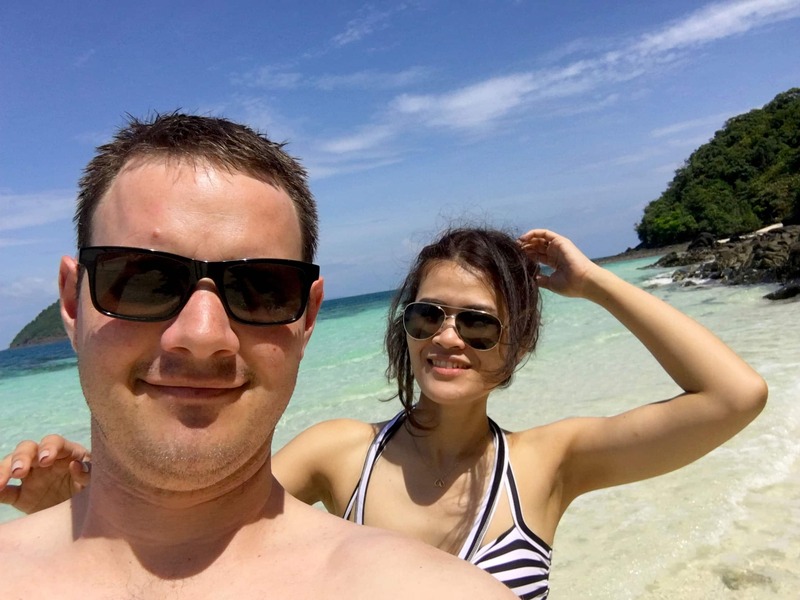 We travel the world to bring you all the best tips and tricks we've learned along the way!